Another in the rack of aged Bourgogne, and next in line for tasting is Domaine Forey Bourgogne 2002. Forey first caught my attention with an exquisite 1995 Echezeaux (from a reasonably light vintage) and I have since been impressed with several vintages of their Nuits St Georges and Clos Vougeot. I’m a little skeptical going in as this introductory level pinot noir was soft and unremarkable at release, but I have enjoyed other vintages of this modest villages blend. The tongue belonging to a far sharper palate than my own likes to say that 90% of all wine is meant to be drunk within 3 years of bottling and the other 10% needs ten years in the cellar. It’s a generalization that I’ve argued against, but whether or not the numbers are precise, the arc of notion is pretty spot on. Yesterday’s Meo-Camuzet Bourgogne 2002, not yet at its decade in the bottle clearly needs more time, while the Domaine Forey Bourgogne 2002, has blossomed quite nicely. I would add that almost all wine benefits from 2 to 3 years in bottle. The Forey Bourgogne ’02 is dark garnet (burgundy?) in the glass and initially there’s a big waft of alcohol that blows off to reveal petrol and asphalt, like scorched earth, in a good way. If the Road Warrior weren’t a righteous racist, I’d like to think this might be his red of choice, in the price range. This wine has benefited greatly from the cellar time and is leagues more interesting now than when it went in. The palate shows dry earth, tar, and crushed roadside blackberries. Most wine consumption is an act of infanticide. 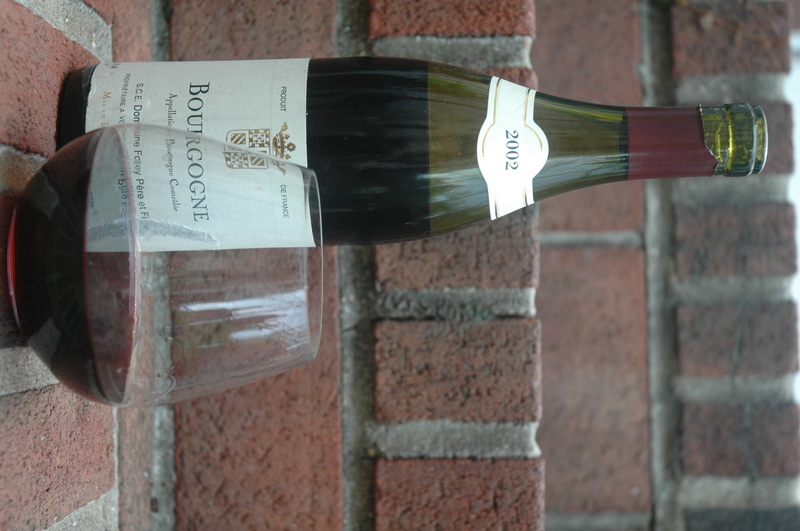 But this ’02 Forey Bourgogne is another example of how well an inexpensive wine, properly stored and aged, can show. Sometimes crushed roadside blackberries is just what you need.